Motivated by the emasculating success of his British screenwriter wife and a love of Easy Rider and The Wild One, Robert Lourdes, a struggling American author on the cusp of 40, finds solace in the Harley-Davidson legend. Robert's last-ditch attempt to become part of his wife's world ends in disaster when she blatantly co-opts his idea for a screenplay during a dinner party for a hideous Hollywood producer. The arrival of Gabriella, a beautiful Italian production assistant with a Harley of her own, stirs in Robert the first tremors of a long-dormant passion. Confused and lacking the confidence to shed the marital skin, he takes further refuge in shiny accessories, rallies, and bigger Harleys, culminating in a 1,700-mile pilgrimage to a major biker rally in Marbella, Spain. 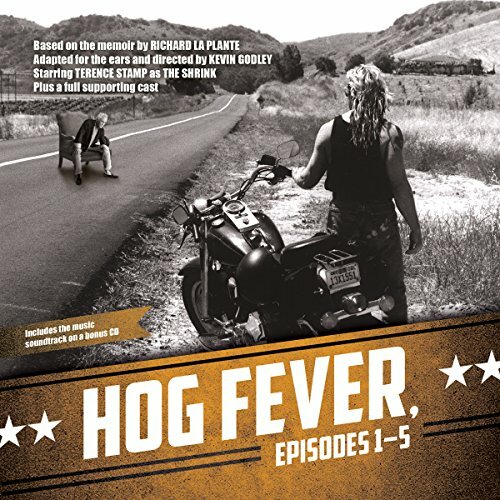 Hog Fever is Robert’s comedy of errors as he embarks on a tattoo-and-testosterone-fueled quest to find himself. LaPlante's story is funny, fast and worryingly relatable. The format is creative, and more than overcomes the traditional bogeyman of audiobooks: bad narration. Instead the book is performed and supported by sound effects and musical beds. Shows that a creative author can enhance his work in the audio format, not simply read it. Repeated listening is the cure. You have to check this out. Now that there is a cure don't be afraid to tell your friends you have Hog Fever.